Understanding the atomic arrangement in liquids is a key problem in the study of melt behavior at high pressure and temperature, both for metals and simple molecular systems, as well as more complex materials such as silicates. Compared to crystalline materials, liquids lack long-range translational periodicity and therefore have a much lower scattering intensity. Therefore, the only structural information available comes through the radial distribution function. Usually, scattering data over a large Q range is needed to provide reliable information, which requires a large energy range and a large sample volume. Recent commissioning activities at Beamline 16-BM-B at HPCAT have included the development of capabilities to accommodate a Paris-Edinburgh press, which has added a new technique available for extreme conditions research. The Paris-Edinburg press project is a collaboration among HPCAT, GSECARS, and COMPRES. Using white beam diffraction methods with energy up to 100 keV, researchers from Ehime University, the University of Chicago, and HPCAT have investigated the structure of liquid albite, NaAlSi2O8. Diffraction profiles collected over a wide range of scattering angles can be interpreted as a combination of structure factor S(Q) and the effective source intensity. 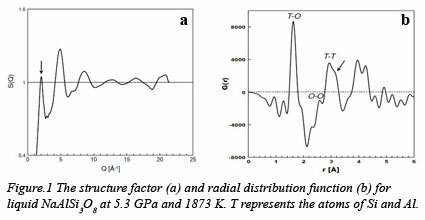 The structure factor is Fourier transformed to yield the radial distribution function G(r) of the liquid, which gives the number of near neighbors in successive coordination shells, as shown in Fig. 1. Here, the Q ranges covered by different diffraction angles are overlapped to constrain the deconvolution of S(Q). Further technical developments in high-pressure x-ray microtomography, absorption mass density and ultrasonic interferometry will be explored using this apparatus. To read more about this key technical advance in extreme conditions research, go to Data collected at multi-angle EDXD [A. Yamada et al., Rev. Sci. Instrum. 82, 015103 (2011)].